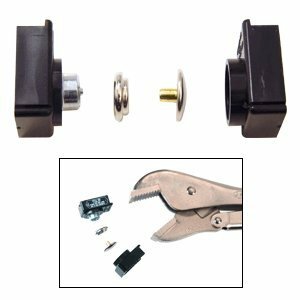 This CRL Button and Socket Fastening Kit provides an easy remedy to broken or missing snap fasteners. The CRL Button and Socket Fastening Kit converts your Vice Grip pliers into a snap fastener repair tool. The Clincher and Anvil slide over the jaws of the pliers and provide the base to hold and flare the eyelet stems. The Kit contains the following pieces: Six AV7677 Buttons, six AV7678 Snap Sockets, one Anvil, and one Clincher. Vise Grips not included.